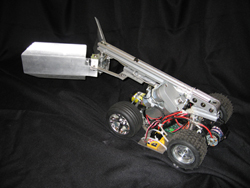 In 2007, the title and goals of the TSA robotic competition changed. The competition is now known as Radio Controlled Transportation and the goals were to pick up random toys and place them into a box and to place a cup on top of the starting box. 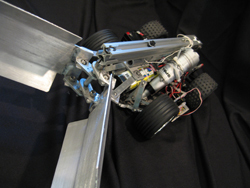 The car is similiar to the one used in 2006, but the turning radius was reduced and the gripper mechanism was entirely different. The car scored highest in the actual competition, yet came in second place when the notebook was factored in. The car will not be entered in the TSA National competition since the participants will be attending the MATE ROV competition in St. John's, Newfoundland.